Bridgeport, CT…Artist’s Lecture by Marc Mellon, Sculptor sponsored by the Housatonic Community College Art Department will be held Monday, September 28, 2015 at the Housatonic Community College Events Center, Room 214 in Beacon Hall at 7:00 pm and is free and open to the public. Mellon’s commissioned projects include bronze busts of President George H.W. Bush (collection of the National Portrait Gallery of the Smithsonian Institution), Pope John Paul II (the Papal Apartments, The Vatican), President Lee Teng-Hui of Taiwan, Winston Churchill, Albert Einstein, and Academy-Award winning actress Patricia Neal. His monumental statues of Kate Smith (Philadelphia), Dr. Alton Ochsner (New Orleans), and George Eastman (University of Rochester, NY) have become beloved local landmarks. Mellon was the sculptor of Barack Obama’s portrait for the historic 2009 Official Presidential Inaugural Medal. In 2011 his bust of the Smithsonian Institution major donor Kenneth H. Behring was commissioned by, and unveiled at, the National Museum of American History in Washington DC. Mellon was Master Sculptor in Residence at Brookgreen Gardens (2009) and at Chesterwood National Trust Historic Site (2012). In October 2012, a bust from life sittings of Nobel Laureate Elie Wiesel was dedicated at the 92nd Street Y in Manhattan, and a second bronze was unveiled at Boston University in 2014. Mellon has also created some of America’s best known sports sculptures. The NBA MVP provided annually by Mellon for thirty years, has honored every NBA MVP since Larry Bird. Recent commissions include a bust of acclaimed author and journalist Tom Wolfe. Mellon’s limited edition dance bronzes have been exhibited from New York to Tokyo, and uniquely capture the strength and beauty of modern dance and ballet. His dance bronzes have served to recognize the achievements of dance world legends Agnes de Mille and Cynthia Gregory. 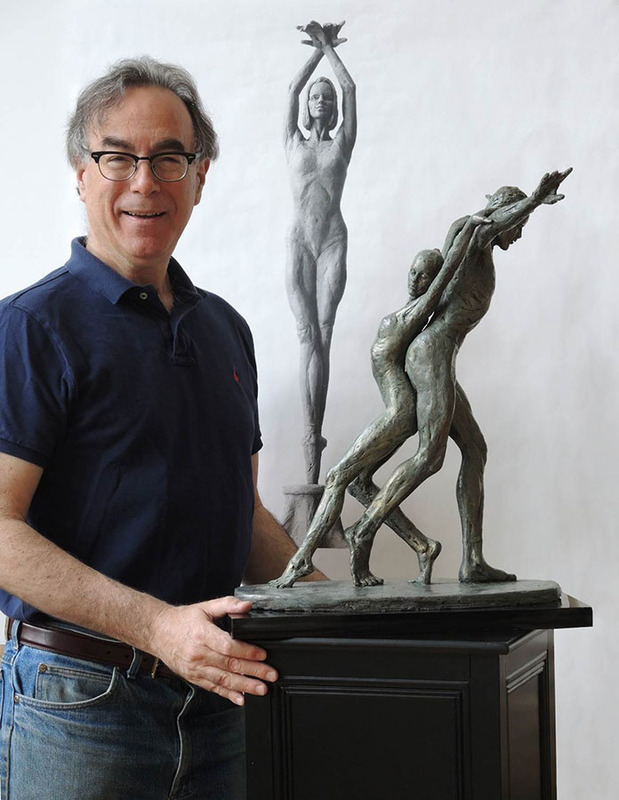 A major exhibition of Mellon’s bronze dancers is scheduled for the Fairfield University Walsh Art Gallery from September 18, 2015 through January 15, 2016. The artist is a regular juror for national sculpture exhibitions, and has received numerous awards, including honors from The National Sculpture Society, The National Arts Club, The Salmagundi Club, and Allied Artists of America. Mellon is an elected National Sculpture Society Fellow, elected artist member of the Century Association, and on the Board of Advisers of the Artists’ Fellowship Inc.
Mellon and his wife, sculptor Babette Bloch who creates contemporary works in sheets of heavy gauge stainless steel, are residents of Redding CT and New York City. Bloch is exhibiting her 9 x 20-foot wall of Magna Magnolia through Dec. 4th at Housatonic Community College. Mellon and Bloch and serve in leadership positions of The Artists’ Fellowship Inc., a charitable foundation assisting professional working artists in times of emergency, and are longtime active members and volunteers at the National Arts Club. For further information contact Pete Rembetsy, prembestsy@hcc.commnet.edu or jfavret@hcc.commnet.edu or call (203) 332-5116. The Housatonic Museum of Art Burt Chernow Galleries are free and open to the public when the college is open. Visit the website www.HousatonicMuseum.org for gallery hours. For additional information about the artist visit www.MellonStudio.com, or call 203 938-0138.